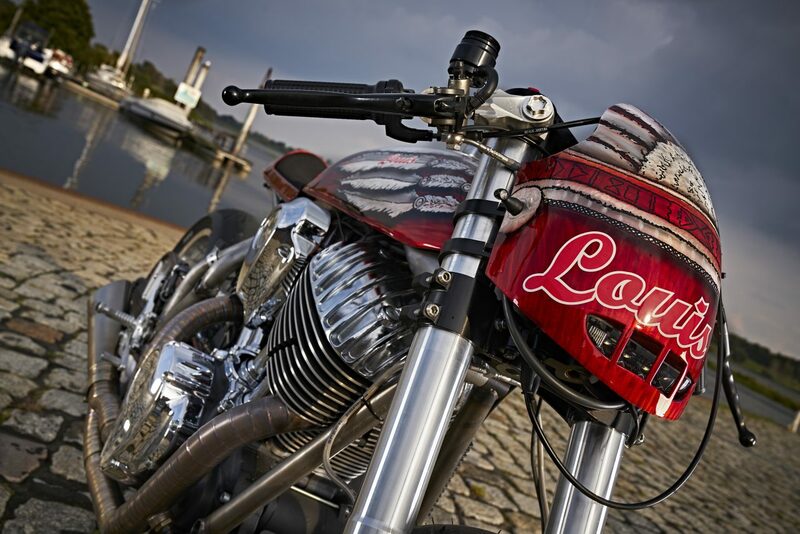 Europe’s market leader for motorcycle clothing and accessories, Detlev Louis Motorrad-vertriebsgesellschaft mbH celebrates its 80th anniversary this year, so to mark the occasion they’ve taken an Indian Chief Vintage and transformed it into the hot-blooded café racer Engina. 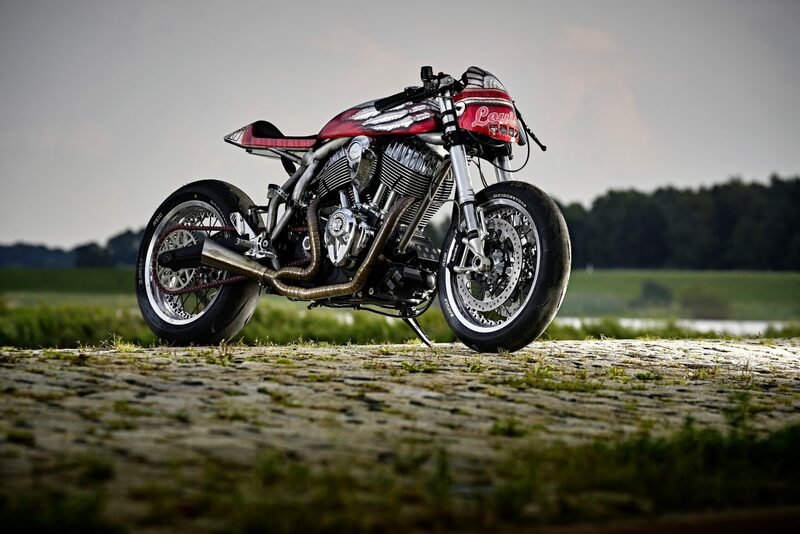 In September last year, Engina had its grand premiere at Glemseck 101 and immediately blew away the competition. Stunt girl and model Mai-Lin Senf rode astride it in the “Clash of Legends” race. 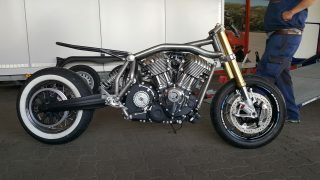 Since then Engina has been cleaning up at numerous sprint and design contests and has just achieved a landmark accomplishment – winning a podium place at the Custom Show Emirates in Abu Dhabi. 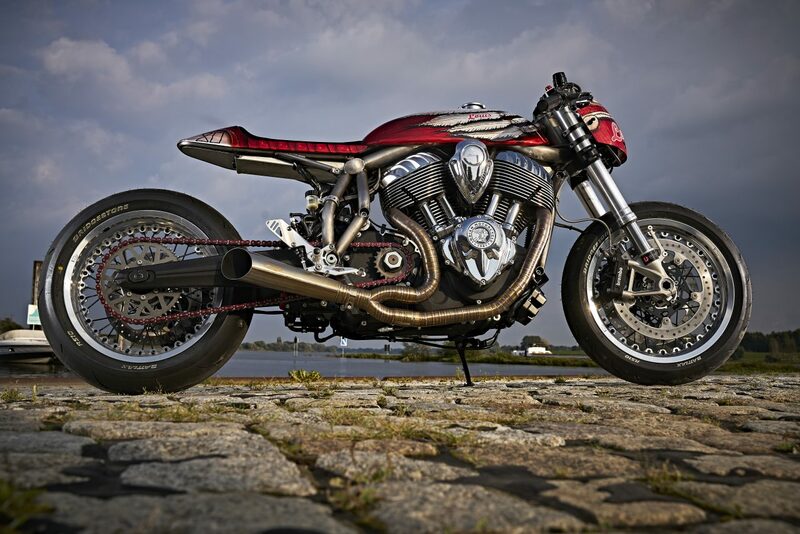 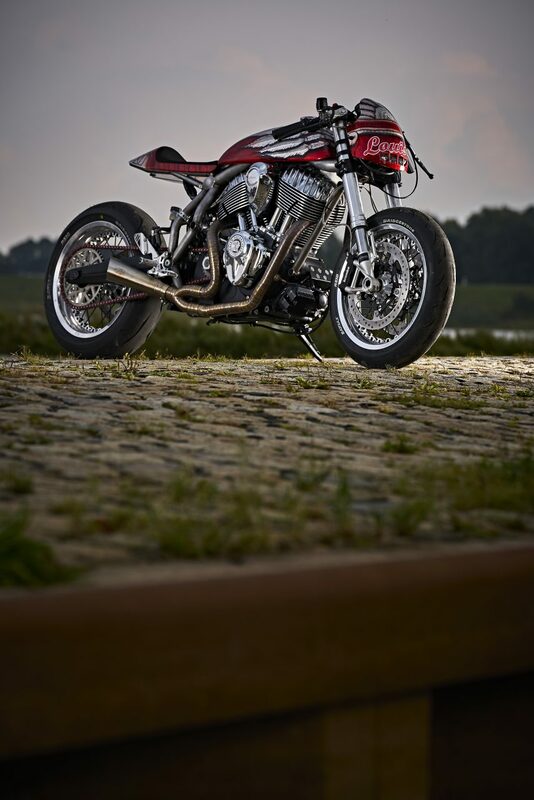 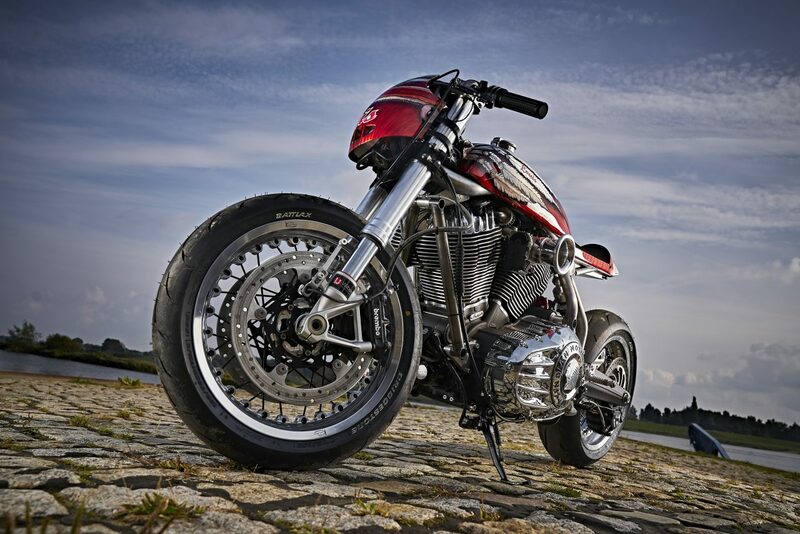 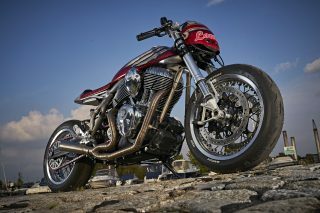 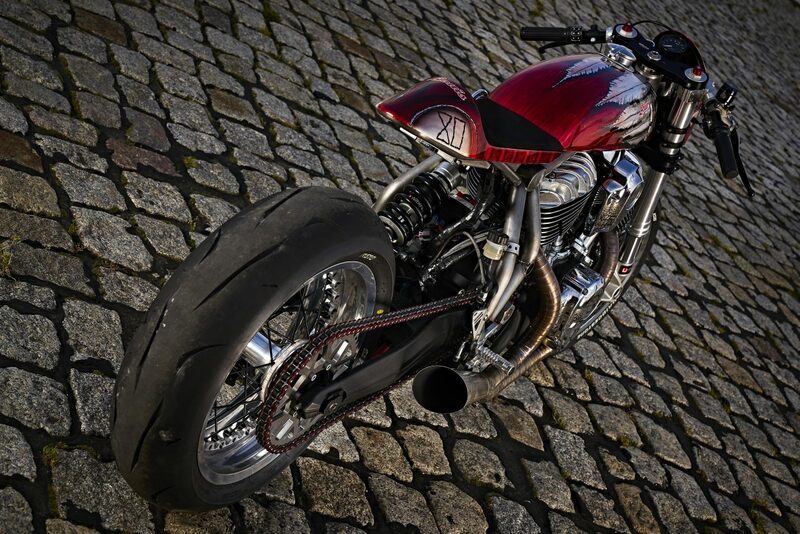 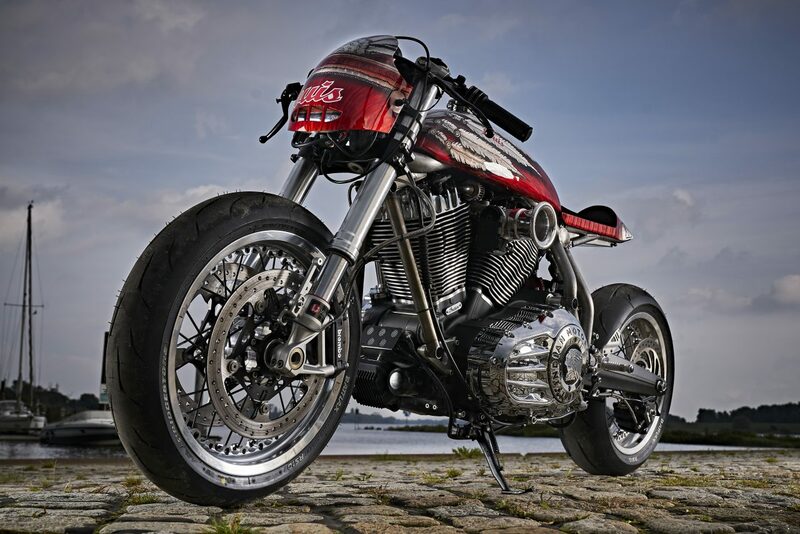 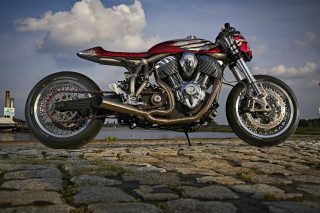 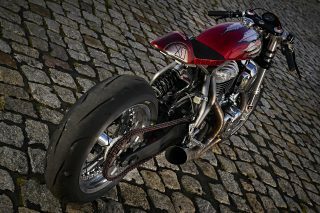 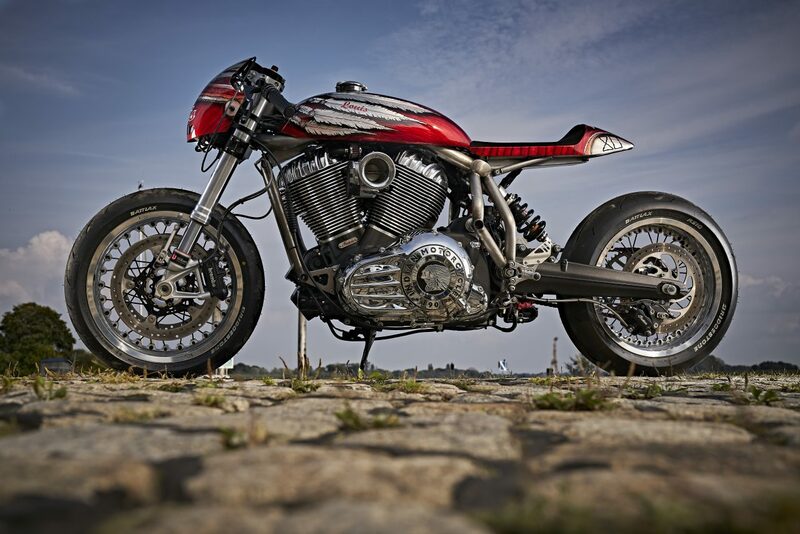 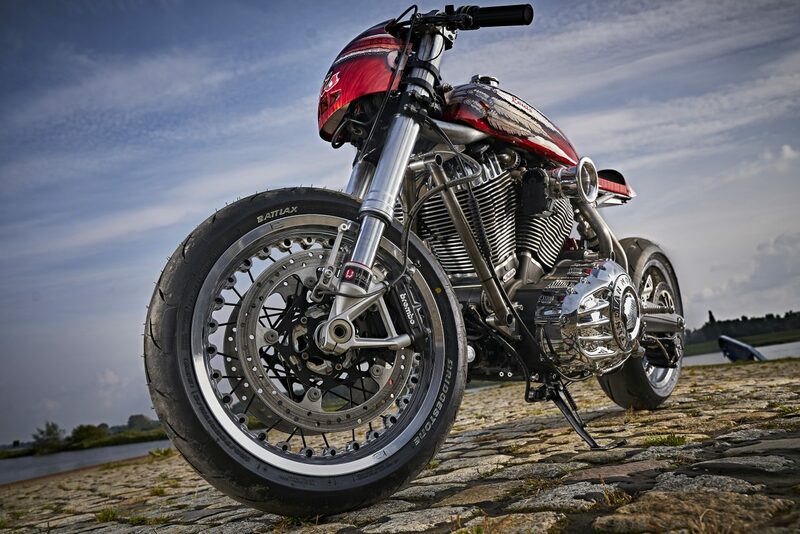 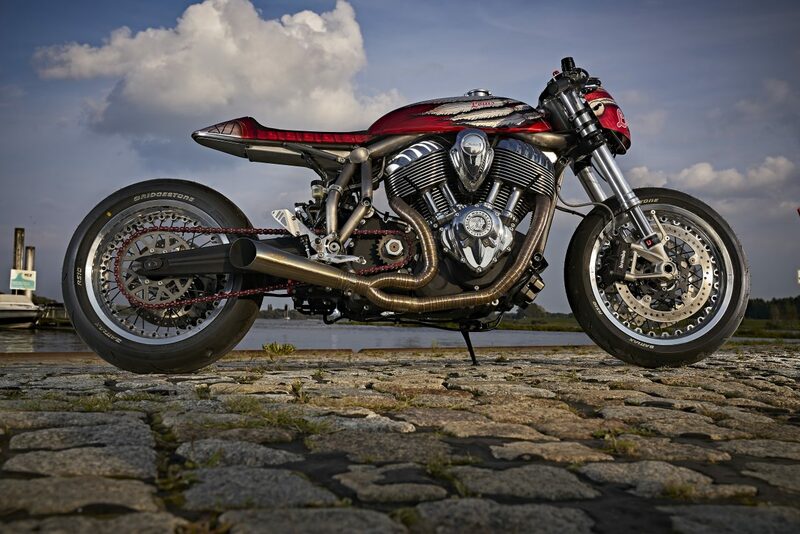 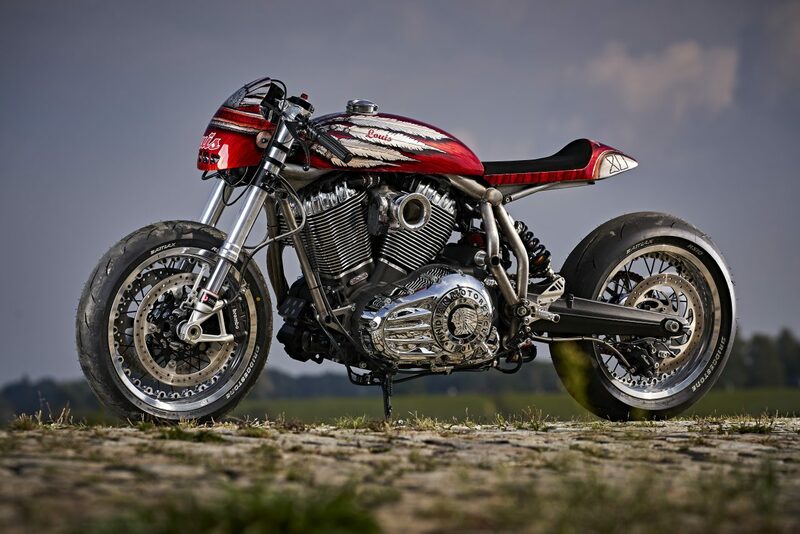 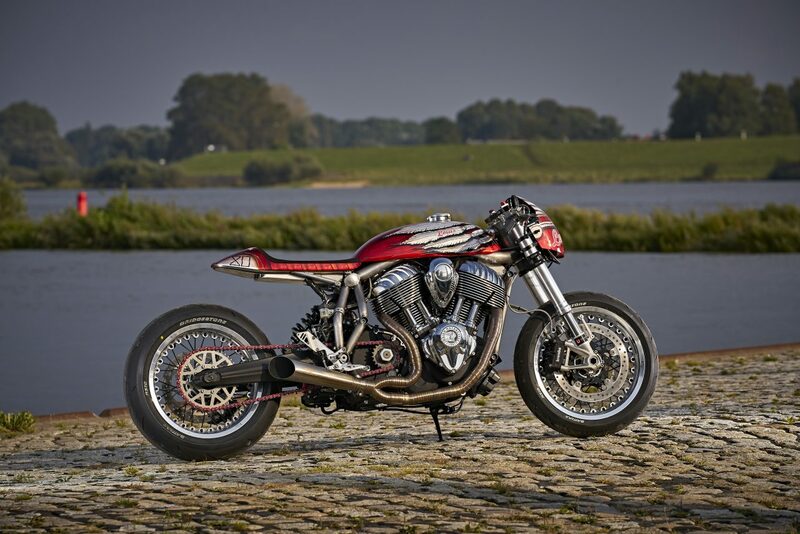 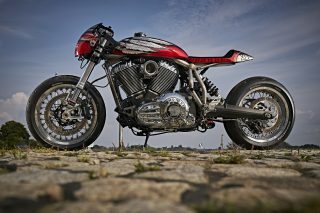 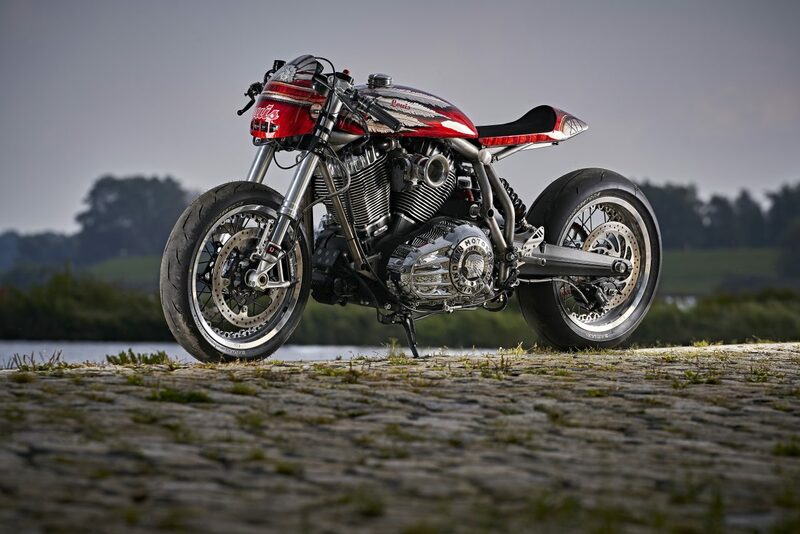 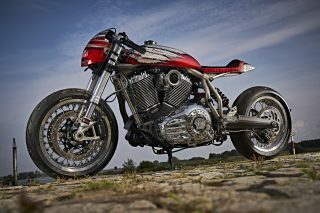 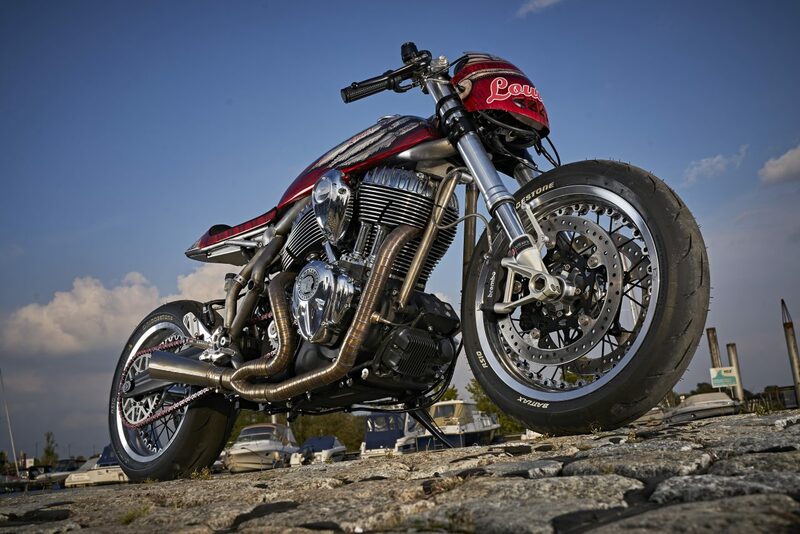 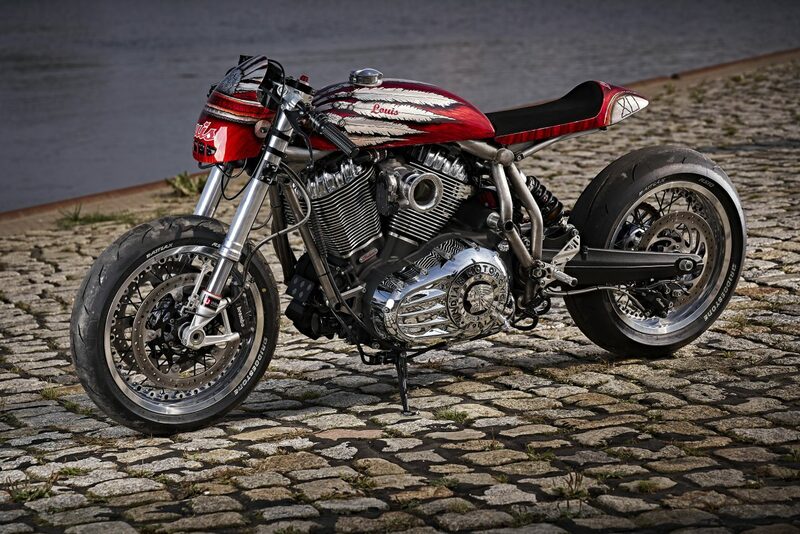 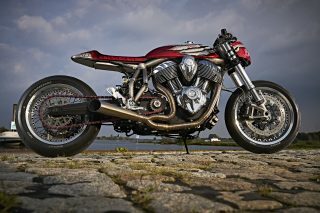 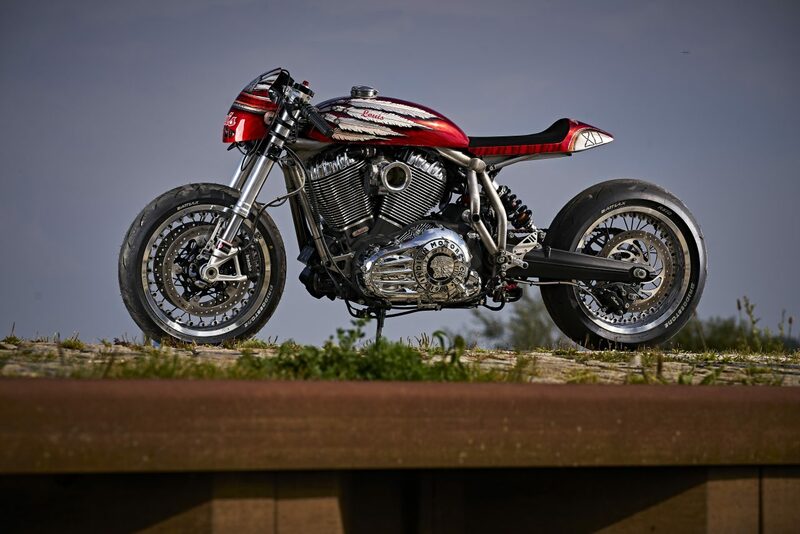 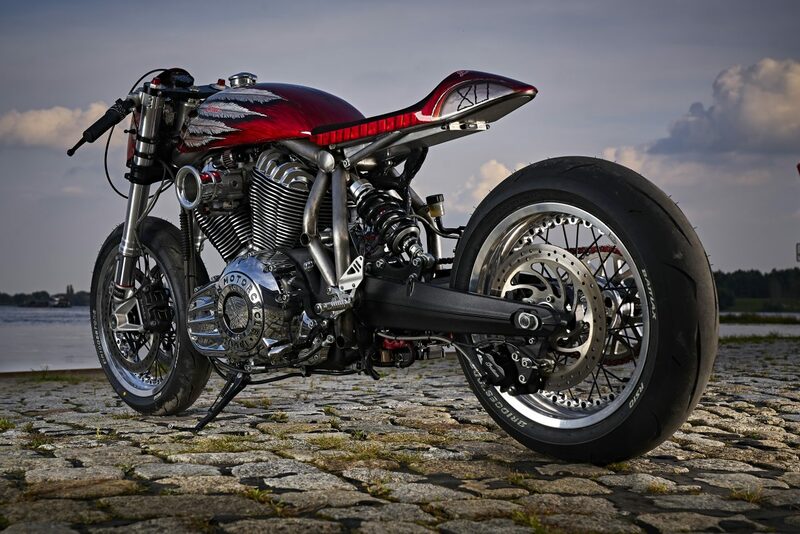 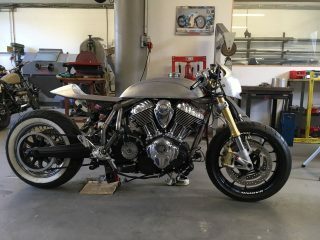 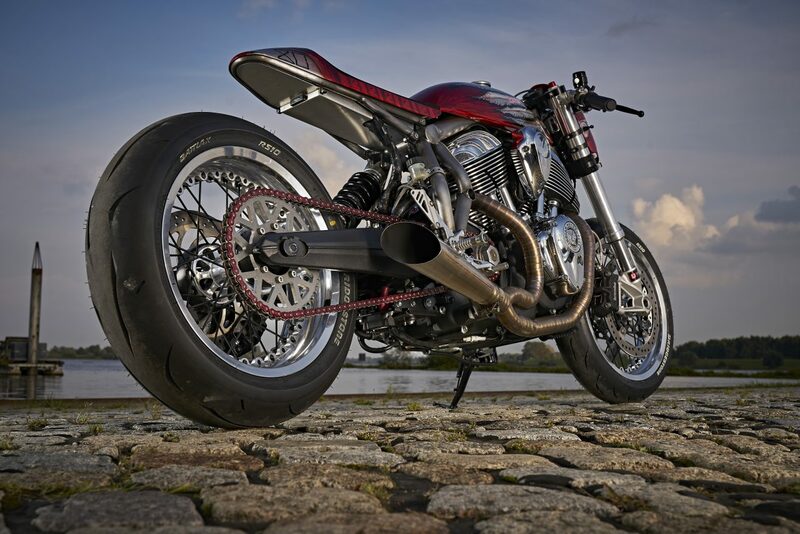 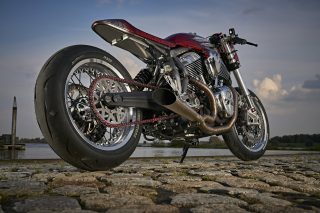 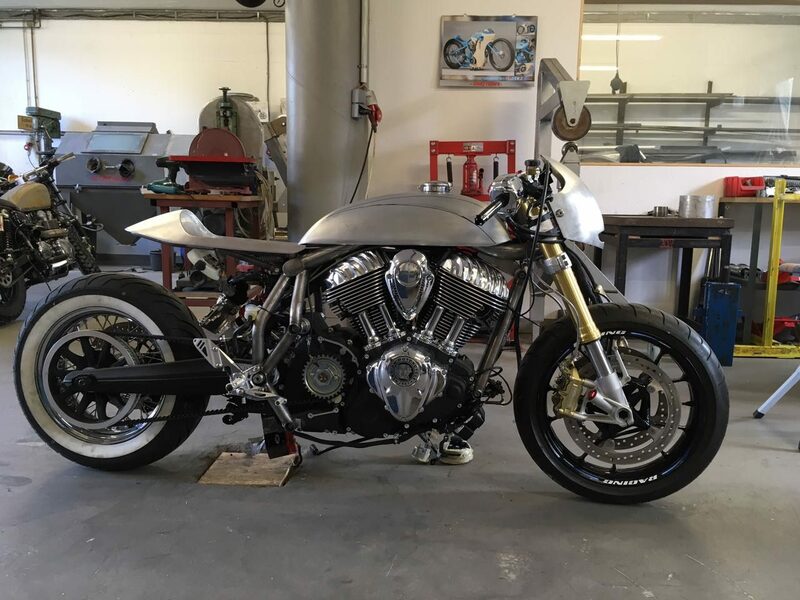 In Germany, it picked up the winning trophy at the Custom Show in Dortmund and won Best Streetbike at the Berliner Motorrad Tage motorcycle show in Berlin. Elsewhere in Europe, the custom masterpiece is also causing quite a stir, winning the prestigious Ferro Dell Anno award at the Motor Bike Expo in Verona, Italy, in the Best Professional category. 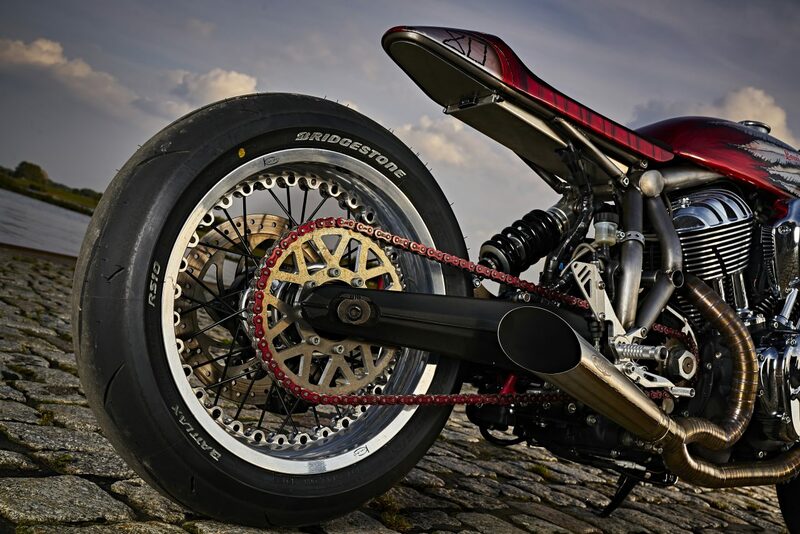 At the Swiss Custom show in Zürich, Engina secured first prize – giving it a ticket for the internationally acclaimed Custom Show Emirates in Abu Dhabi. 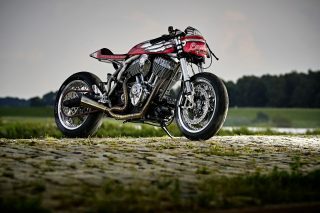 On this world stage last weekend, Engina competed in the V2 Custom Class – with a sensational result, taking 2nd place. 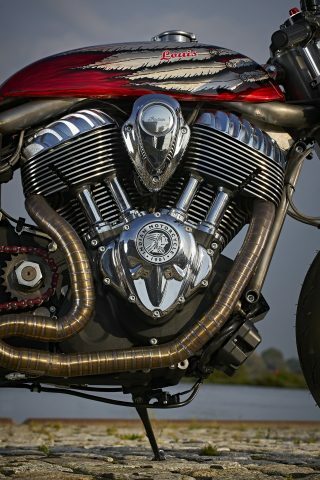 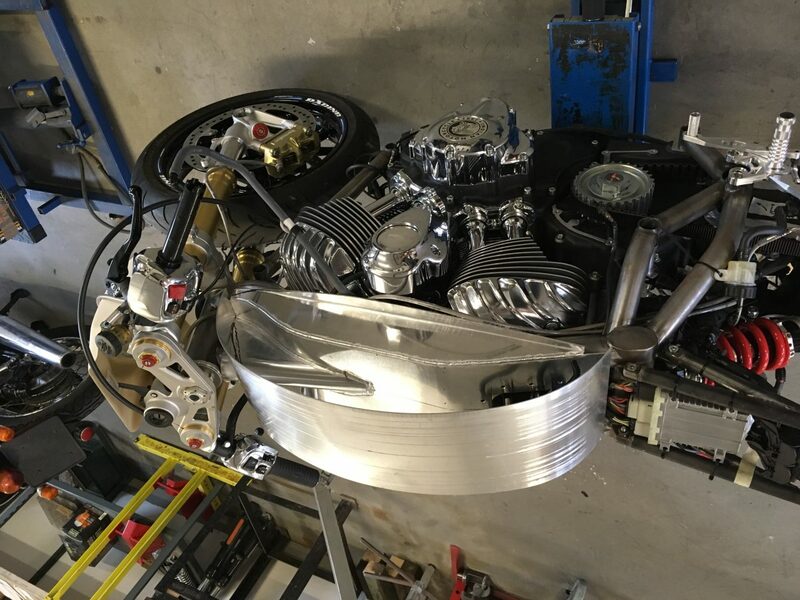 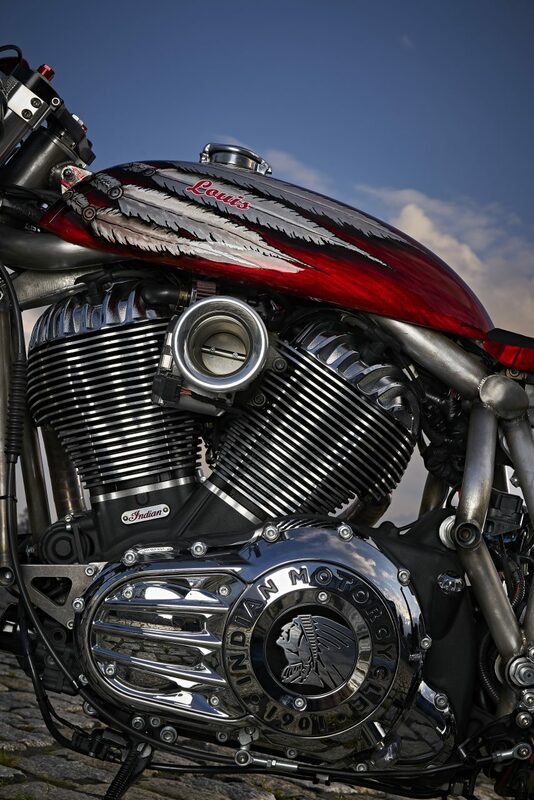 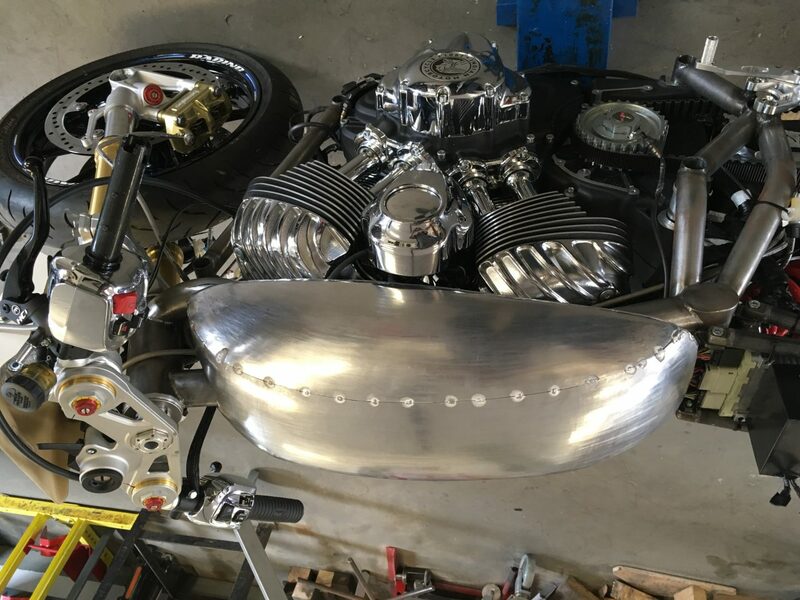 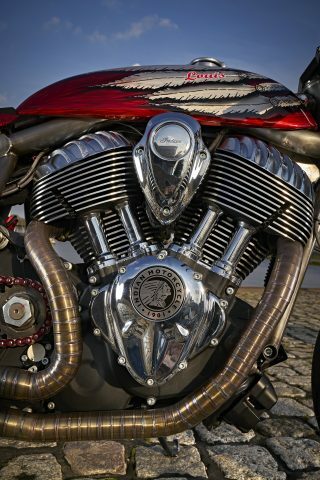 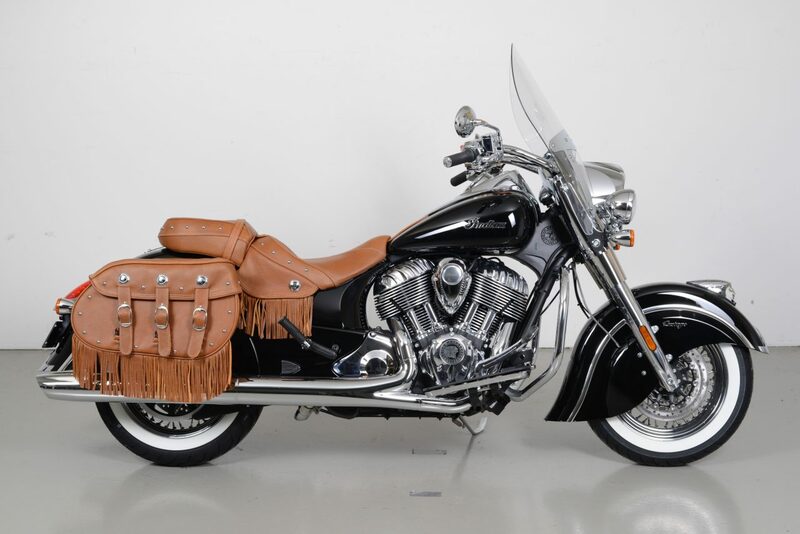 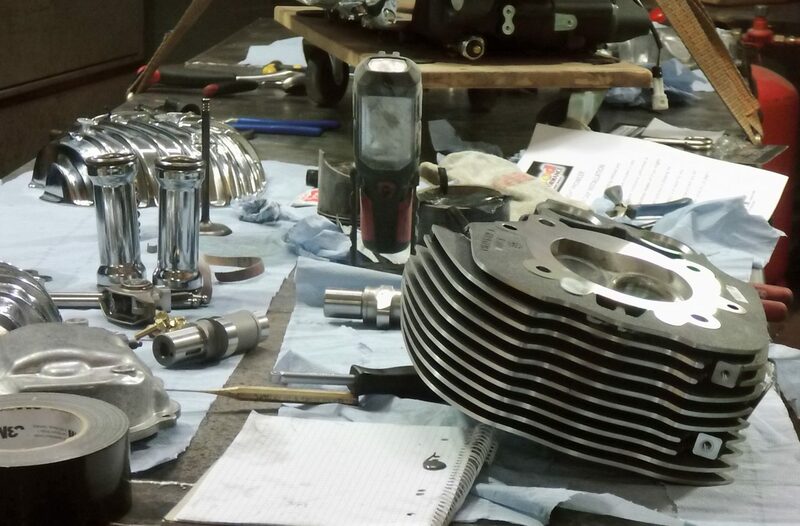 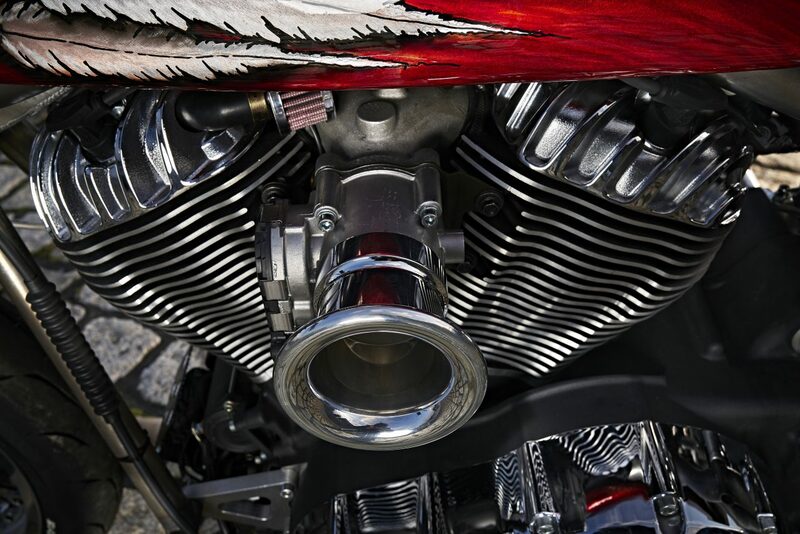 Much of the credit for these brilliant results must go to Indian’s beautiful-looking Thunder Stroke 111 engine – this magnificent V-twin is definitely an integral part of the overall artistry. Louis has given this chrome power plant pride of place to – hence the name Engina, which is derived from the word engine. 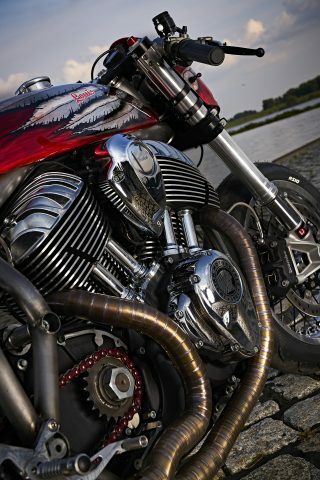 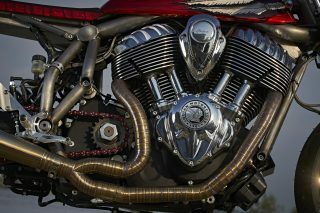 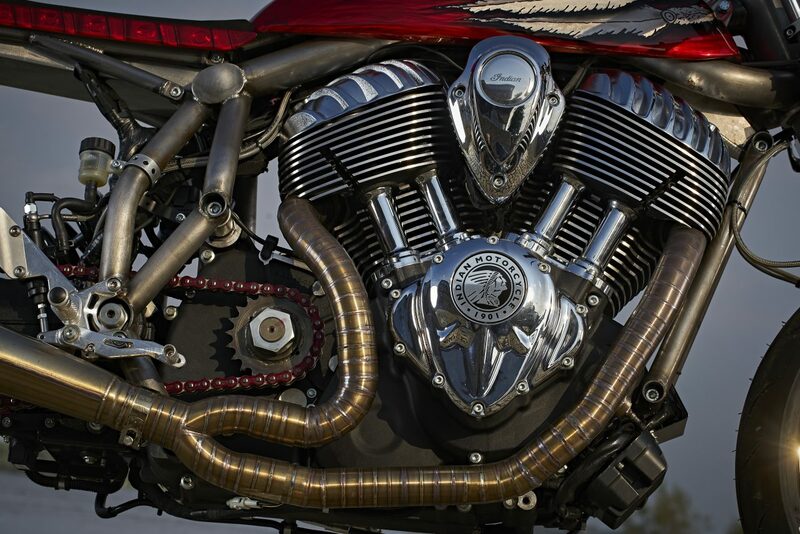 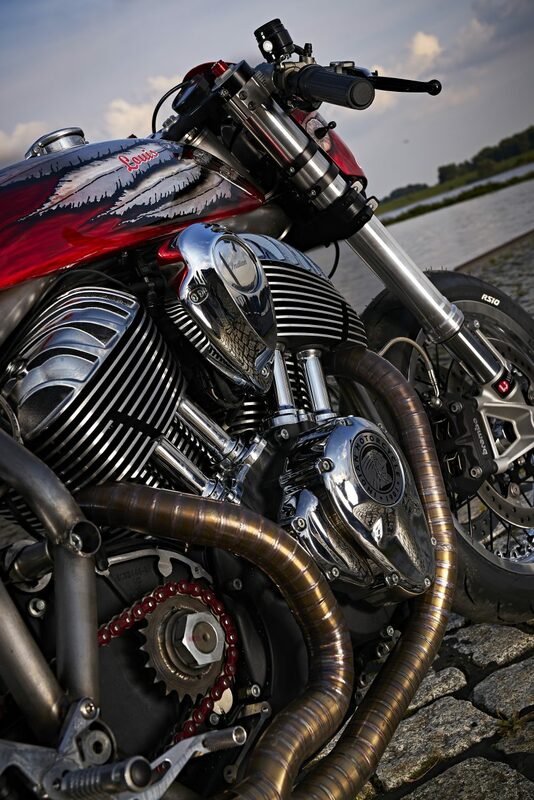 The powerful 1.8-litre V-twin is a stunning combination of the classic Indian look and state-of-the-art technology. 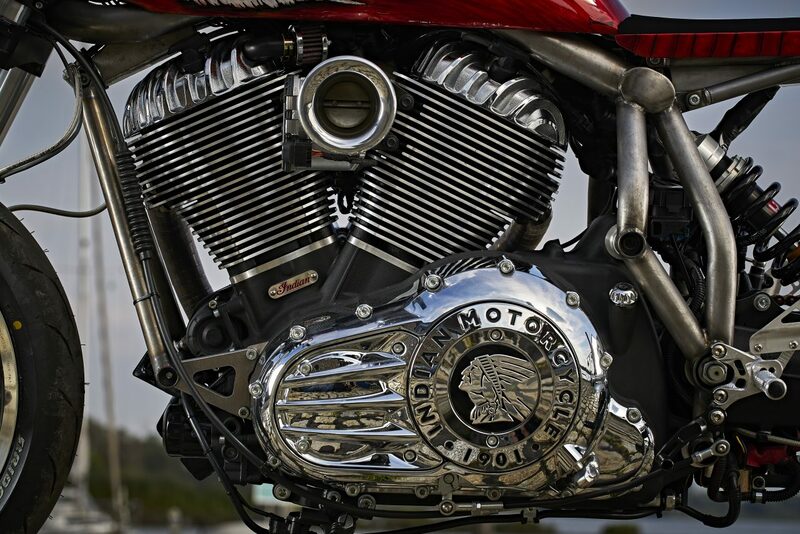 The distinctive design with eye-catching pushrod tubes and cylinder head covers with angled fins pays homage to the Indian engines of the 1940s and 1950s and enjoys cult status among the fans. 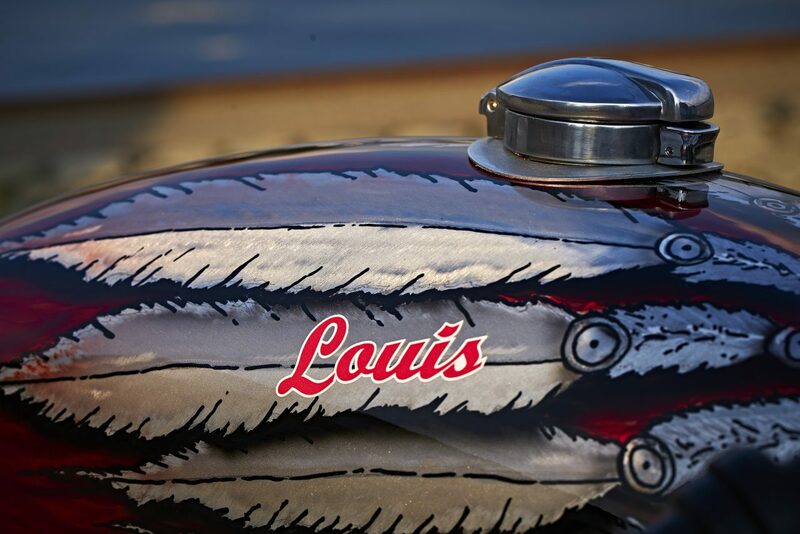 To give it the power needed to compete in sprint races, Louis brought in the engine specialist Ulf Penner to exploit the full potential of this extremely high torque engine. 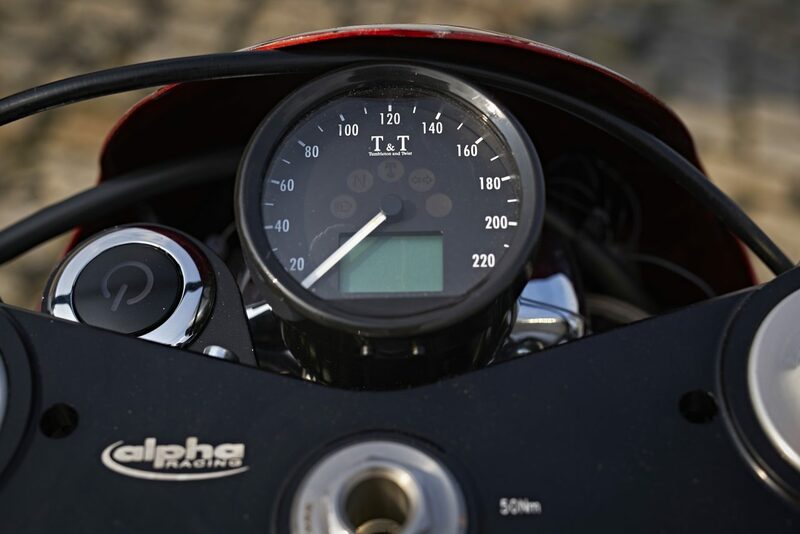 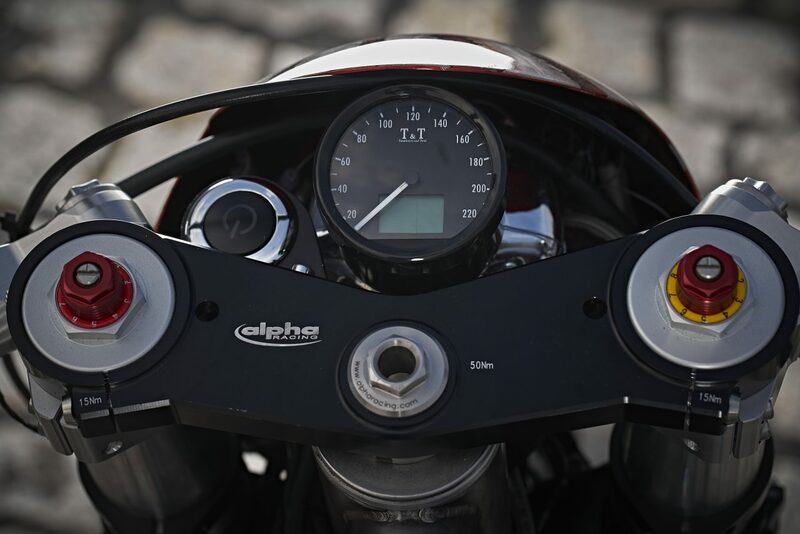 With a whole range of optimisation measures, such as more aggressive camshafts, more direct airflow, upgraded cylinder heads and new engine mapping, the Thunder Stroke 111 that has been virtually untouched visually now delivers almost 70 per cent more power. 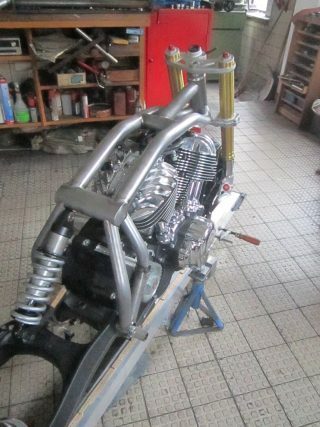 A new header from STParts with a Shark silencer makes sure the 125 hp power package also has the sound to match. 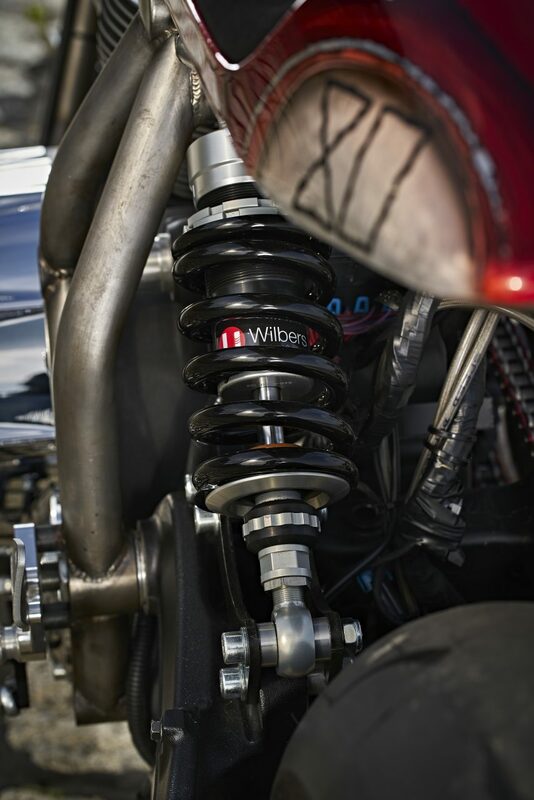 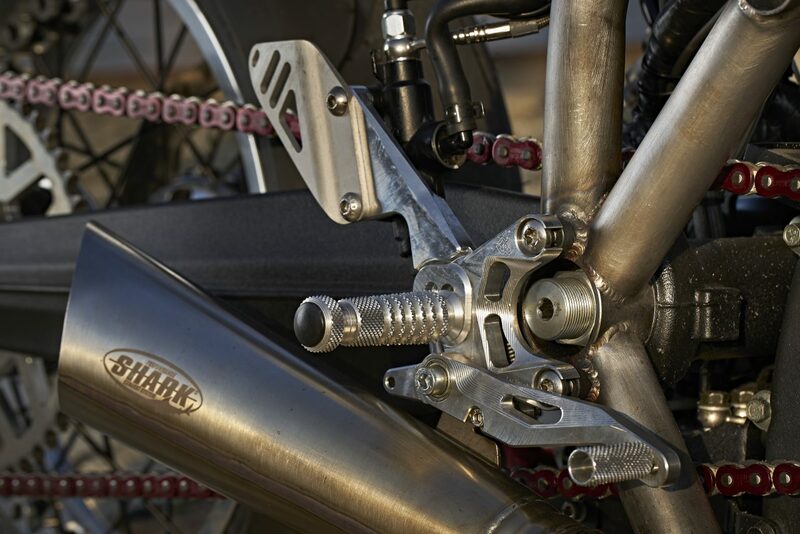 It all fits into a new UNO lightweight frame, and the high-performance chassis now has a new upside-down front fork and Wilbers rear shock absorber. 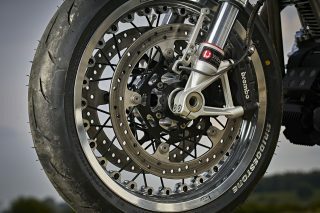 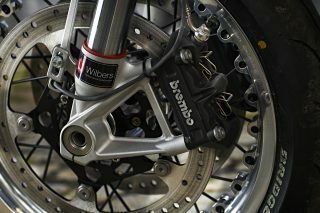 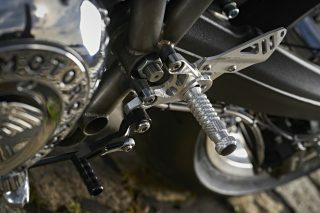 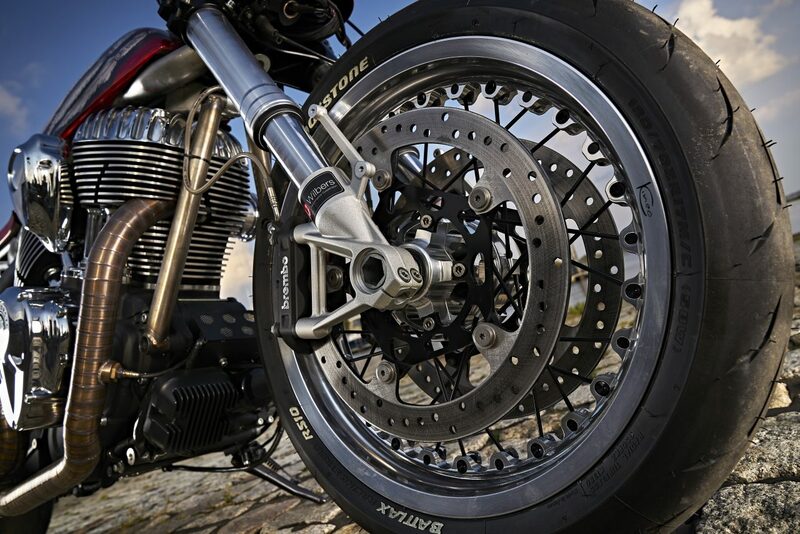 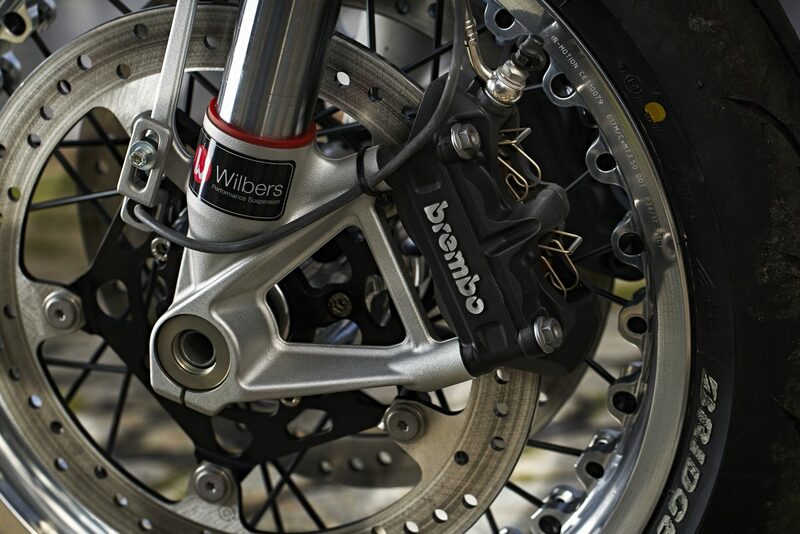 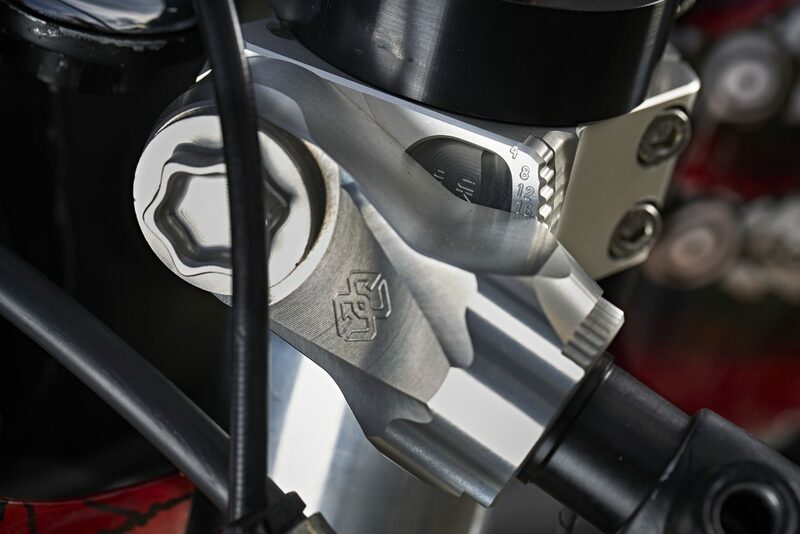 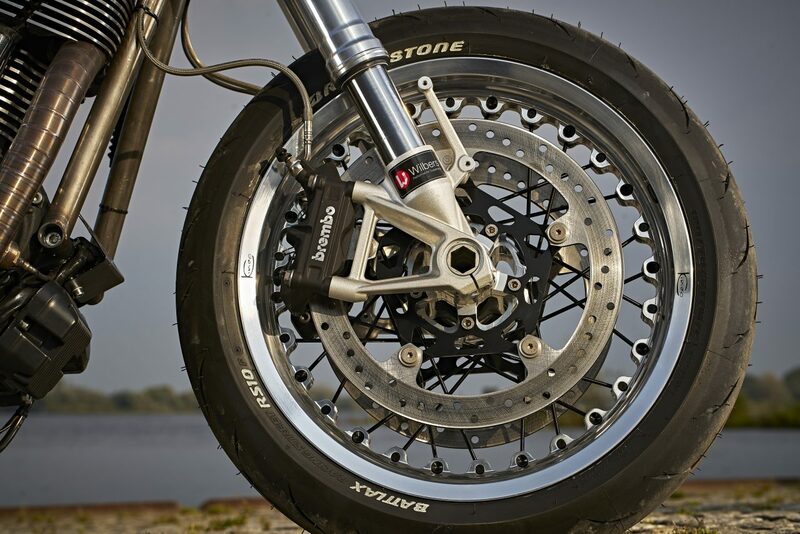 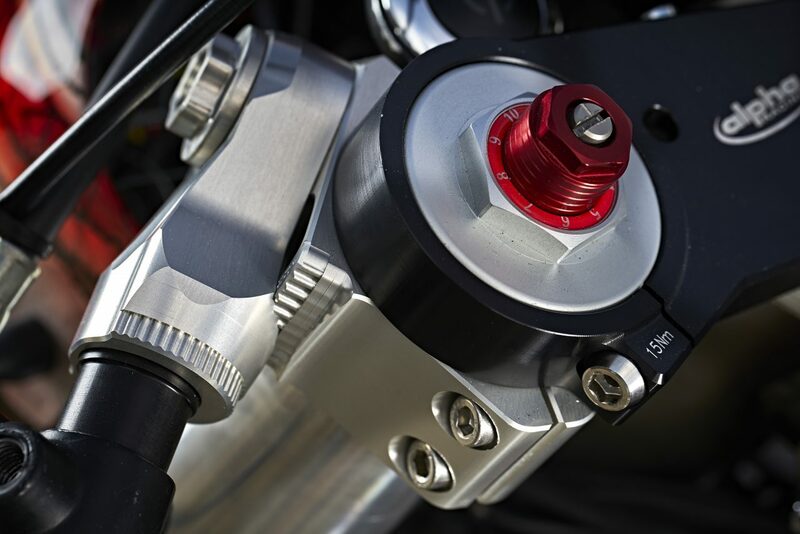 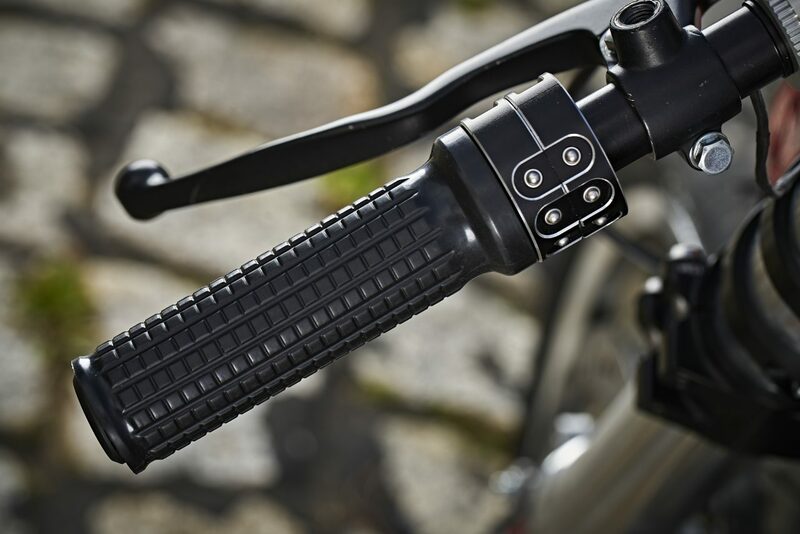 A Brembo braking system delivers the stopping power to the custom-made Kineo rims and there are new triple clamps from Alpha Racing with a matching Gilles stub handlebar. 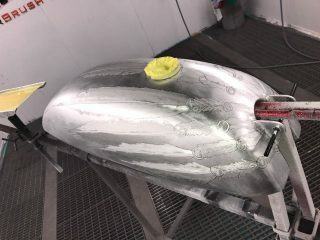 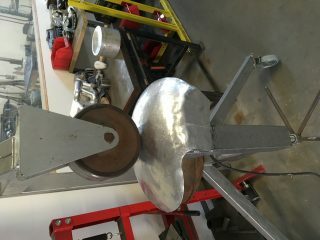 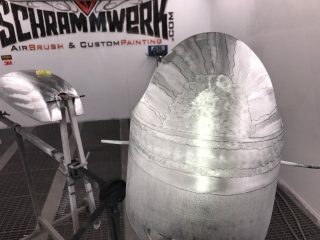 For the headlight bezel, seat and tank, Louis called in Michael Naumann. 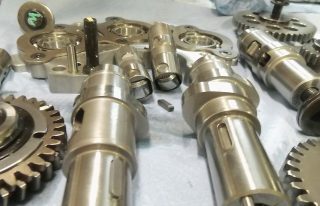 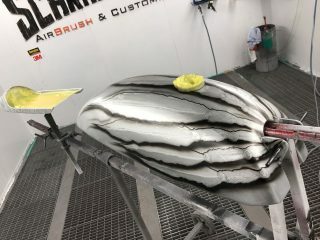 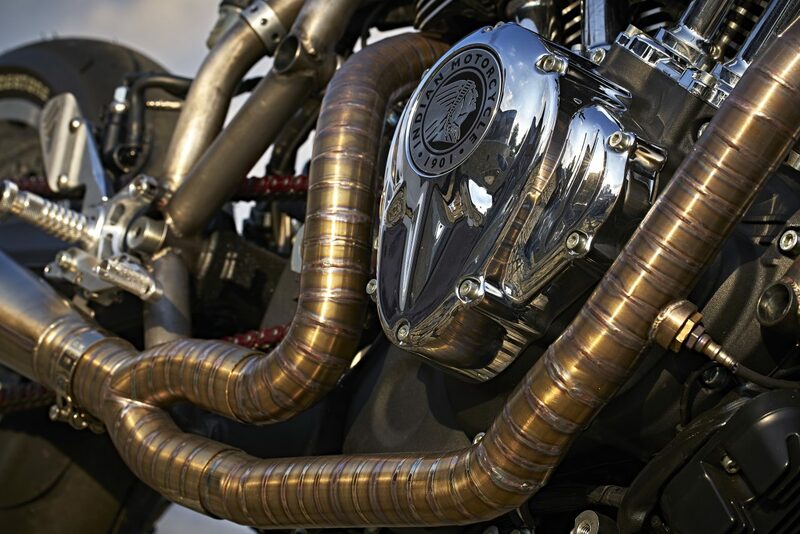 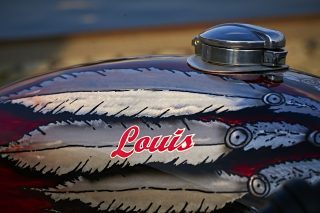 The customizing specialist has already picked up numerous awards for his custom creations and enhanced the minimalist design from Louis gearhead crew member Kay Blanke to perfection. 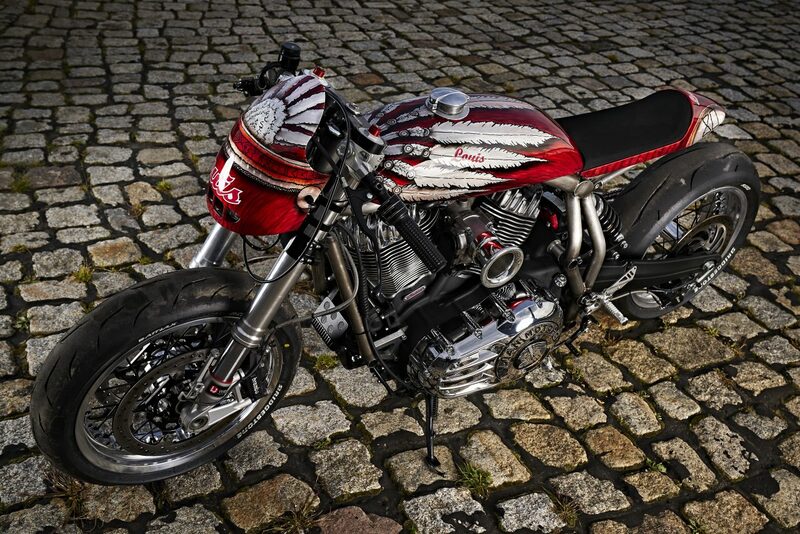 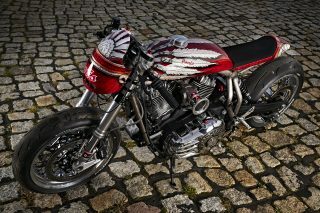 Danny Schramm from Schrammwerk was responsible for the striking headdress paint job in red and white, taking on the colours of the Indian and Louis brands. 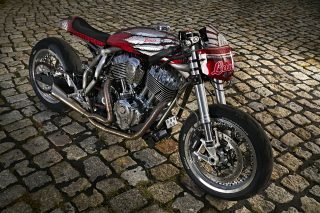 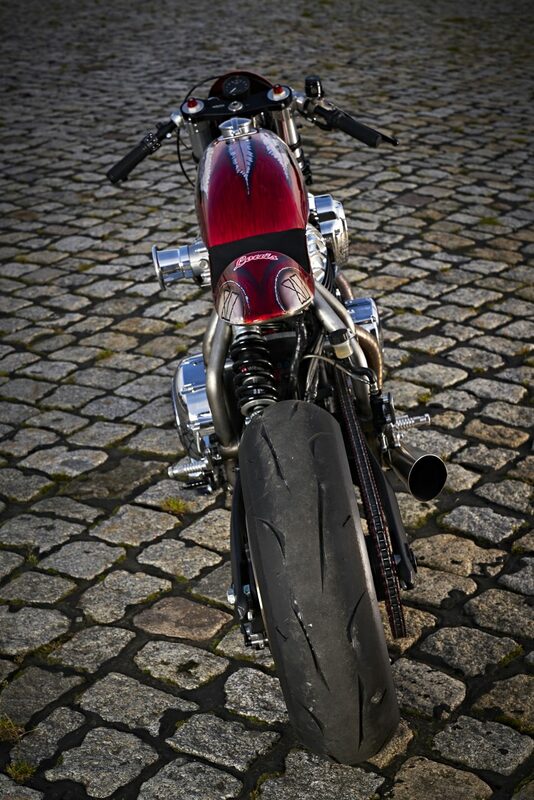 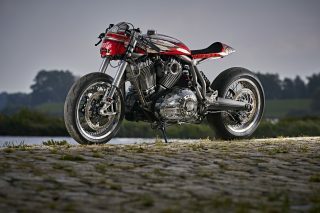 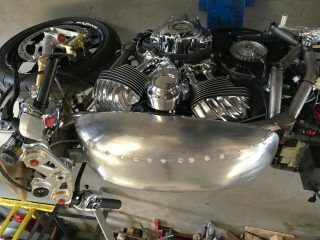 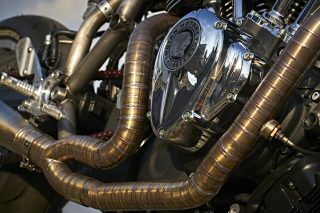 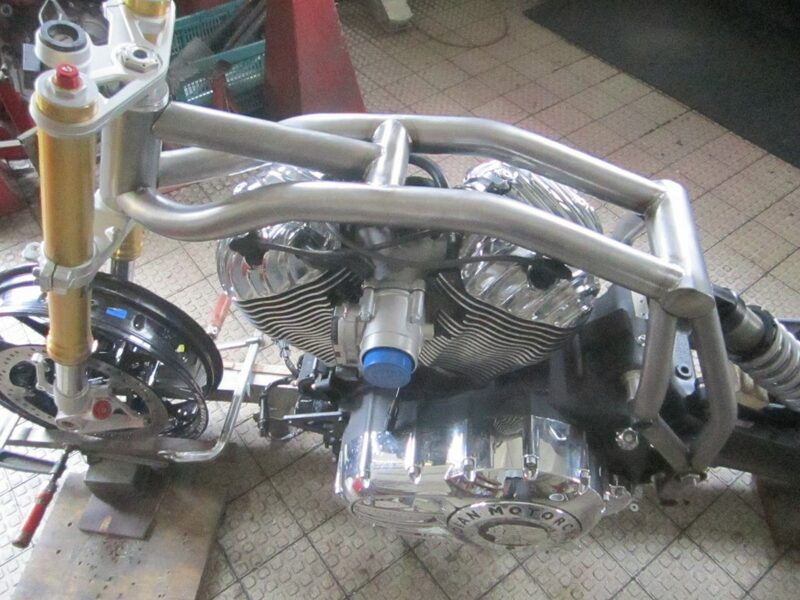 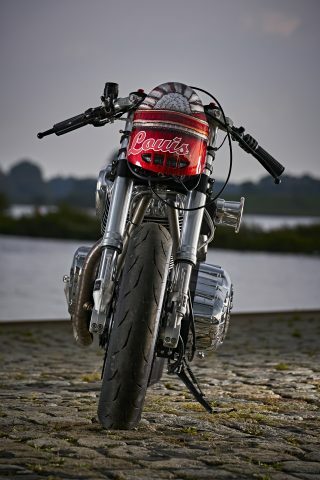 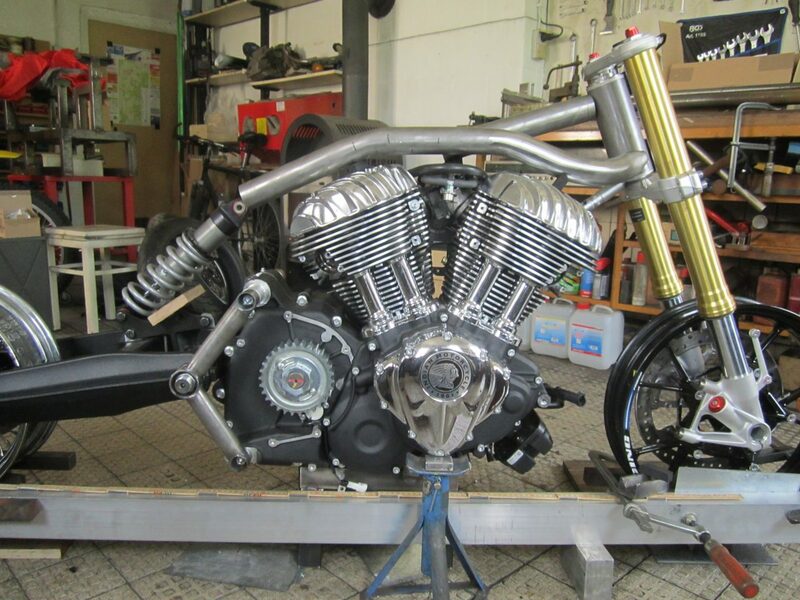 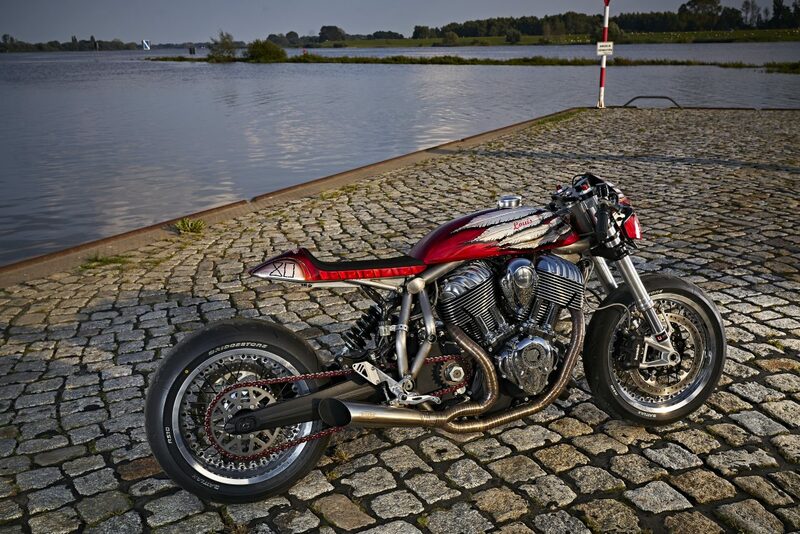 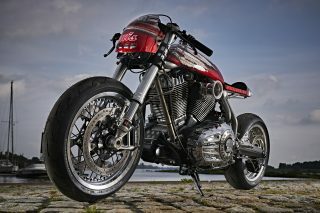 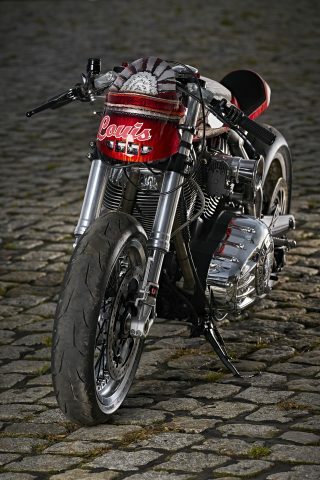 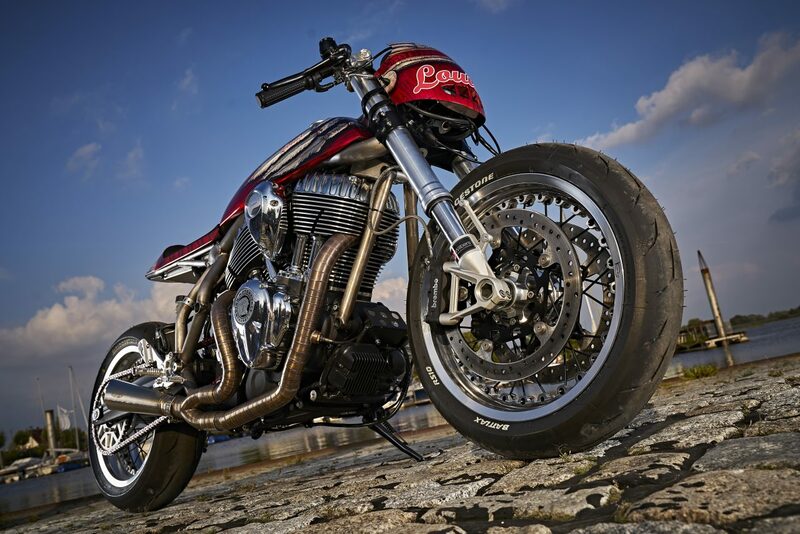 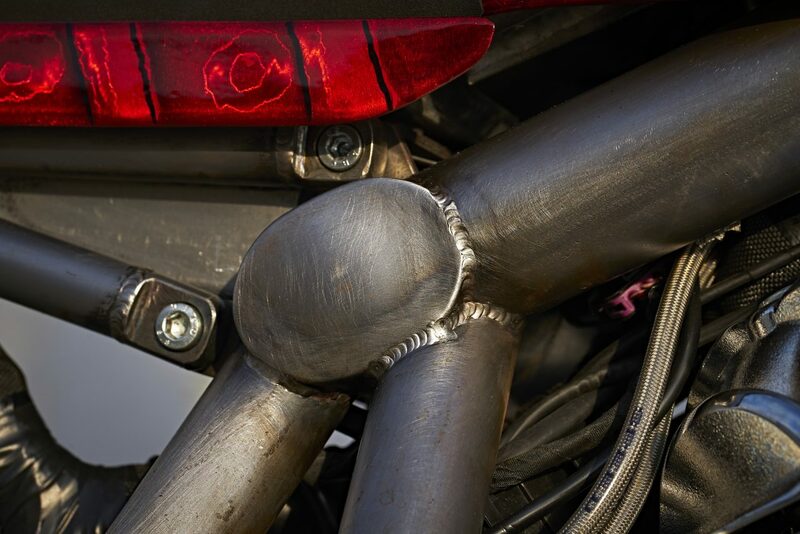 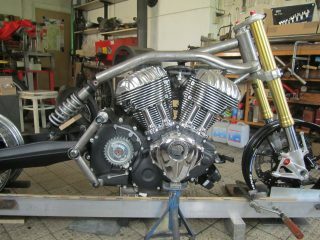 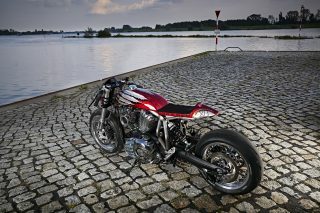 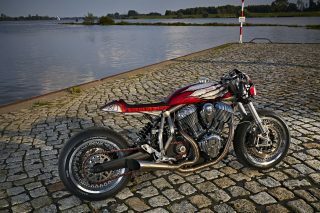 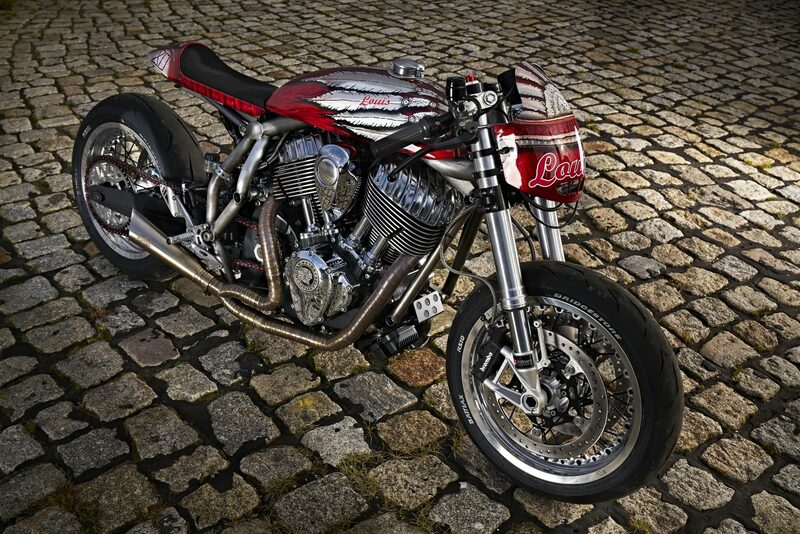 The bike’s overall build was undertaken by Detlef Stüdemann and Martin Struckmann from the Louis gearhead crew. 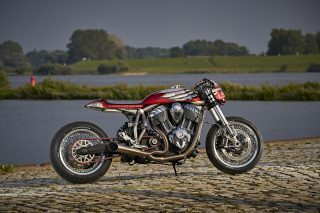 Please photo credit Volker Rost for the images used in this release.